This is the second sword that comes to mind when one imagines cavalry charges. This sword was used in the US from about 1860 through the Civil War, and finally the Plains Indian Wars of the 1870's and 1880's. This sword, like it's predecessor the Model 1840 Heavy Cavalry, was also not well received by the Cavalry officers and troopers. The weight of the sword was not greatly different from the Model 1840 and therefore, was considered by many, unimproved. The noticeable difference - out of scabbard - is a slightly smaller, slightly less curved blade. The most noticeable difference - in scabbard - between the 1840 and 1860 is the shape of the grip. 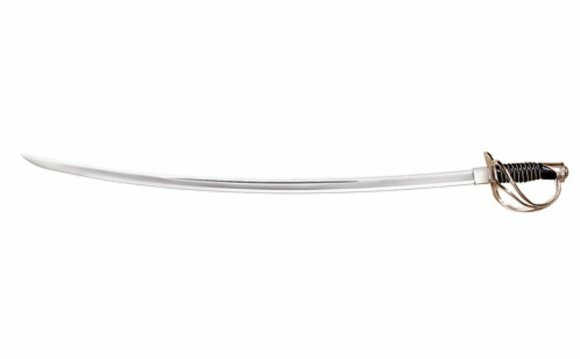 The Light Cavalry Saber of 1860 was meant to replace the 1840 Heavy Cavalry, but this transition was not to come until after the Civil War. The designations Heavy and Light do not necessarily refer to the weight of the sword; they do, in fact, refer to the "shock" impact delivered during a "charge". A Heavy Cavalry unit was more "heavily armed" whereas a Light Cavalry unit was "lightly" armed. This sword is also pleasing to own and display. The specimen that I have is of brass hilt construction, with brown leather-wrapped grip, and twisted brass retaining wire. Typical blade dimensions are ~35" in length and ~5-16" by ~1-1/16 in cross-section at the ricasso; length of ricasso is ~1"; stopped, broad primary fuller ~26-3/4" by ~5/8" with an unstopped secondary narrow fuller (within the primary) ~18-3/4" by ~1/16"; 34" cutting edge with ~27" backedge (including the ricasso, but excluding the false-edge which is ~8" in length). The Model 1860 is another derivation from French patterns and again, there are many variations (mainly imports). It was replaced by the Model 1872 "Light" Cavalry Saber. I have various information on West Point Cadets - graduates and non-graduates - from 1802 to 2002. If there is a name on your sword - and that name is registered as a West Point Cadet - I can very likely supply basic information on that individual. I charge $10 to search, non-refundable. If a record is found, I will forward that information on to you via e-mail; if no record is found, I will e-mail you to that effect.